Kentucky State University had to go to bat twice but it scored a run naming its new athletic director. Etienne Thomas comes over from Kansas University to take over the Thorobreds athletic program. Thomas formally takes the place of William Graham who announced earlier in the spring that he would retire. However, she’s the second person who was in position for the job. In June Trayvean Scott was announced as the new AD but he withdrew his application, citing family reasons. KSU President Christopher M. Brown II says he wanted Thomas to apply the first time around but she couldn’t due to other obligations. The second time around however the timing was right. Thomas served as the associate athletics director for student life while at Kansas. She has worked in administrative positions previously at North Carolina Central University, Howard, Saint Paul’s College, and San Jose State. During her time at NCCU, she helped the Eagles make the move from the CIAA to the MEAC. Thomas is an NCCU alum. 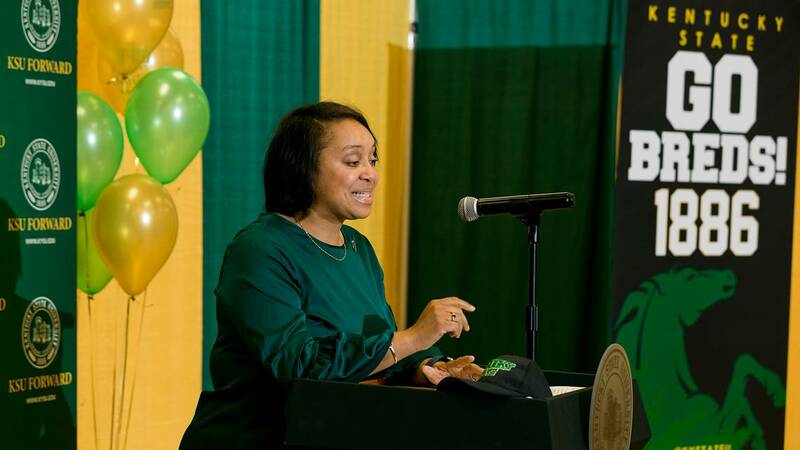 “I am humbled and honored to serve as the director of athletics at Kentucky State University,” Thomas said. “President (M. Christopher) Brown is the right president for me. He has a vision. He’s intentional. He doesn’t believe in excuses,” Thomas said at her press conference. Thomas apparently isn’t coming to Frankfort to play small ball. Her 18 month to do list includes finding an on-campus home for the softball team and adding tennis, soccer, and swimming to the athletic program. “When we remember that the work that we do in higher education is about students and making them the best that they can be now and in the future, then we are doing our work correctly,” Thomas said. It was also a good day for President Brown. The board of regents voted to extend his contract at the university through July of 2022.